You will find Vrede en Lust nestled in the foothills of Simonsberg, in South Africa’s Franschhoek Valley. 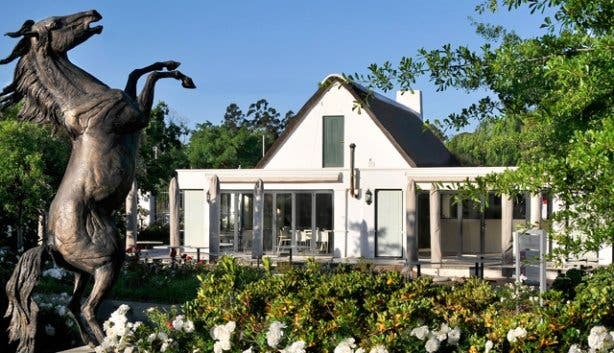 The name is derived from the Dutch: ‘Peace and Passion’ and this modern boutique wine farm is home to a winery, a country bistro and deli, a historic manor house and a wedding and function venue. 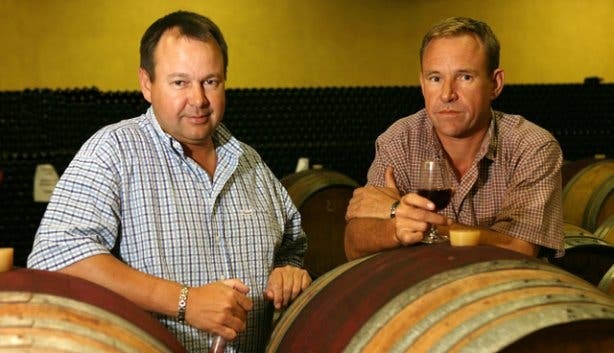 Current owners, brothers Dana and Etienne Buys, acquired Vrede en Lust in 1996, with a grand vision in mind: that it would become one of the loved wine farms in South Africa. Indeed, we sat and talked about Vrede en Lust for hours, when we paid the farm a visit. The farm is a rich tapestry of family histories and legends, dating back over 300 years. Such stories are passionately reflected in the wines; each unique in personality. Dana and Etienne, in collaboration with 2007 Landbou Weekblad Woman Winemaker of the Year, Susan Erasmus, worked to renew the wine farm, in order to realize the potential of the land; and with remarkable results. 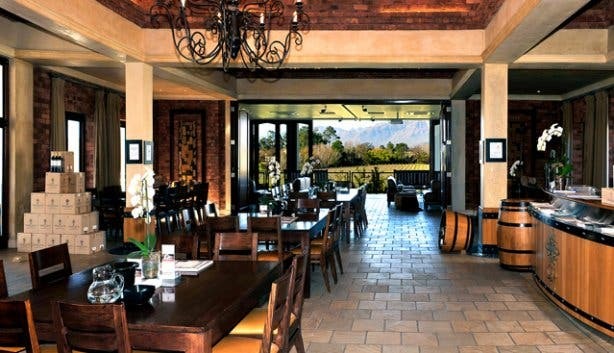 Vrede en Lust now boasts an award winning range of wines, and highly regarded country bistro and deli, Cotage Fromage. 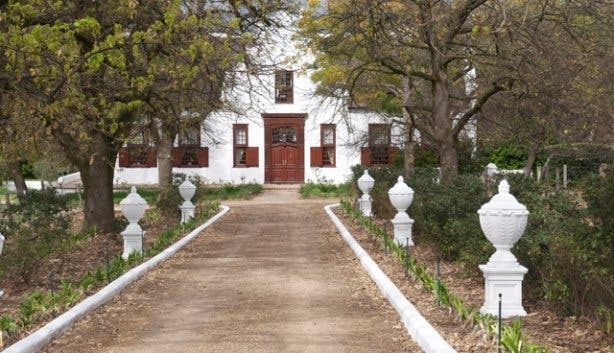 Vrede en Lust was first established by Jacques de Savoye, a protestant who arrived with the Huguenots in 1688. 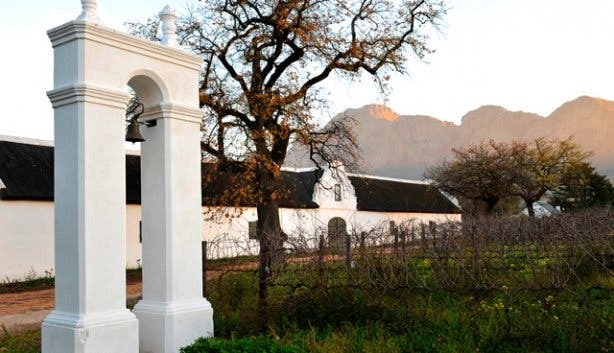 He described the land as ‘the most beautiful place’ and ‘truly African’ and had grown 10 000 vines, by 1691. Although the land was started as a wine farm, it saw 17 different owners over the years and even spent some of its time as a fruit farm. Nevertheless, the land has always been family owned and managed, with strong ties and noble histories. Dana, with an IT background and Etienne, a viticulturalist, have done nothing to break this tradition. Not only do they reside here with their families, who are all involved in some way, but they actively celebrate the wine farm’s rich history. Much like the idyllic mountain ranges within which the wine farm is set, Vrede en Lust’s Wine Plaza is earthy and elegant, characterized by family photographs, fresh orchids, fireplaces, couches and passionate reds. Visitors feel at home and relaxed, in a place that is testament to Anneke’s warm personality. Vrede en Lust is a family orientated wine farm that does not aim to exclude and prides itself on a good customer experience. Visitors include children, students, connoisseurs and professionals alike. Wine is something people tend to get into with age, which is why they try not to exclude younger visitors (after all, youth will inevitably be older one day). Vrede en Lust wants people that aren’t familiar with wine to re-emerge, having learnt a thing or two and walk away with a passion-filled experience. Vrede en Lust produces the bulk of it’s grapes on it’s three vineyards, Vrede en Lust, Ricton and Casey’s Ridge, and the balance is sourced from quality grape growers in the region. The philosophy is simple – high quality, honest wines that are handcrafted onsite. Marguerite Chardonnay 2009, has been aged in a selection of different aged barrels so the oak is in not intrusive, which gives it a beautiful balance between fruit and oak. Marguerite was, in fact, Jacques de Savoye’s eldest daughter. The free spirited, French Aristocrat, married a Bengal slave at the farm, which at the time was frowned upon. However, it turned out that the Bengal Slave was of royal blood, so she still stood to inherit the farm. Marguerite’s free spirit is captured in this wine. In keeping with tradition, Dana has named wines in honour of his two daughters, as they have reached the age of 16. Jess Dry Rose 2010, named after his eldest daughter, is made from specific pinotage and shiraz grapes, with strong notes of strawberry and watermelon. New release, Sarah Chardonnay 2010, named after his youngest daughter, is easy drinking, light and crisp, with white pears and tropical fruits – it reminds one of youth. Boet Erasmus 2007, is in honour of Dana and Etienne’s grandfather, Boet Erasmus, is Vrede en Lust’s flagship wine. It’s a new world Bordeaux style blend; elegant and with layers of dark fruit, cigar box and a hint of spice. Erasmus, a former vice president of the International Rugby Board and mayor of Port Elizabeth, played a major role in raising Buys brothers after their father died. He also loved wine and introduced them to fine wines. The Boet Erasmus 2007 has won numerous awards, the most prestigious being the trophy for Best South African Red Wine at the 2010 International Wine Challenge in London. Dana and Etienne live by their grandfather’s philosophy and are involved in charity work. They pledge to plant a tree for every 10 cases of wine sold, in conjunction with Trees for Life. This year alone, they aim to plant 4,000 trees. By planting the trees, they support the fight against global warming and climate change. We had the pleasure of tasting these exquisite, easy drinking wines, along with the Sauvignon Blanc 2009, the Vioinier 2009 and the Mocholate Malbec 2009. Our tasting platter, from the deli, was a selection of cured meats, breads, cheeses, olives, chutneys and smoked salmon, that complemented the wine beautifully. As we walk around the grounds, we are introduced to Duncan Doherty, an event and catering expert who heads the sunny, Cotage Fromage. 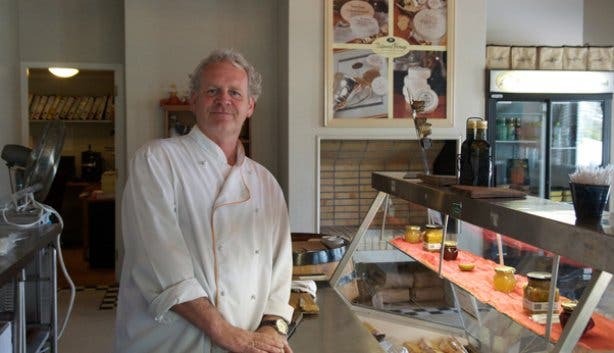 The restaurant, which Duncan tells us is especially nice during the summer months, is a combination of life’s greatest pleasures; food, wine and music. It’s an ideal stop for breakfast or lunch, serving light, sophisticated cuisine that changes seasonally. The restaurant offers live music on Sunday afternoons. 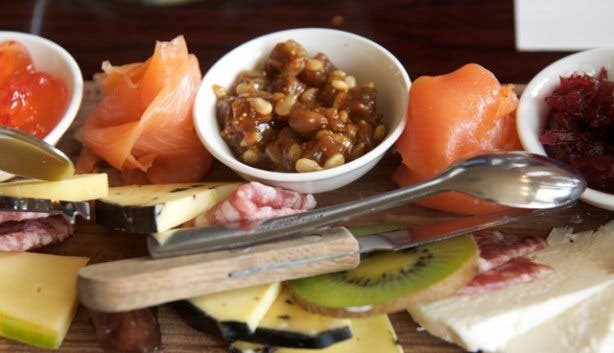 The adjoining deli can carry up to 60 different cheeses in season, which are sourced locally, from the Franschhoek Valley; and a selection of cured meats, chutneys and olive oil. The deli also has its own bakery with a variety of freshly baked breads. 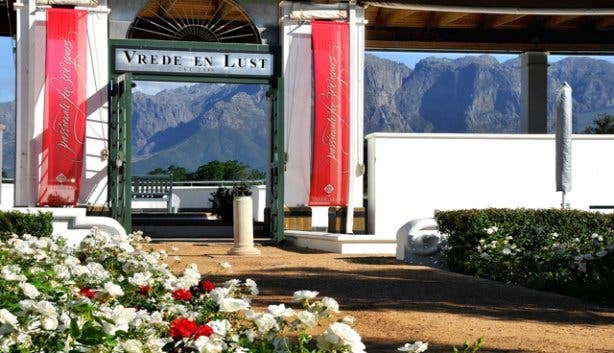 Vrede en Lust is often hired out for the whole weekend and can accommodate up to 140 guests at the Vineyard Terrace venue. Couples may wed under a gazebo, in gardens set amongst oak trees and overlooking mountain ranges, or in an old barn with rustic, oak beams. There is a tented area for lavish receptions and Vrede en Lust has an onsite wedding co-ordinator. 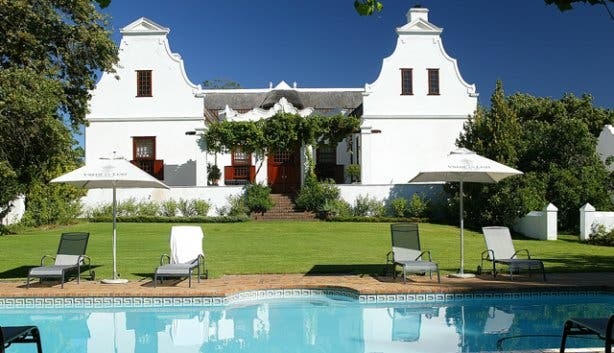 A heritage site, the manor house and Jonkmans houses can accommodate up to 22 guests and marries old world charm with modern, breezy suites with a pool house that is perfect for braais. Vrede en Lust are open 7 days a week, from 10:00-17:00. Tastings are free and cellar tours are priced at R25 per person. Vrede has special eStores in UK, USA and Europe, and have a delivery system nationwide if you wish to purchase wine. They also operate a Wine Club. Fancy pairing fine wines with farm cuisine, or embarking on a wine safari? Be sure to read our Winelands Section.